"That man does not look anything like a ninja." "Ah, but that is exactly what a ninja should look like." The shadow warriors of medieval Japan, reputedly possessed of all manner of mysterious powers including invisibility and intangibility. Able to infiltrate even the most heavily guarded fortress without being detected. They may be portrayed as cutting down any opposition with superhuman swiftness. Traditionally dressed in black bodysuits with black masks or veils to hide their faces. They are the ultimate spies and assassins, gifted with their own deadly magic and martial arts. Born in hidden villages, they are trained from birth to obey an alternative code of honor to bushido—to show no pain, feel no emotion, and remain loyal to their clans under pain of death, or the third code of getting as much money as possible. Or so popular legend has it. While ninja may have existed, their reputation for invisibility and infiltration more likely stemmed from their willingness to dress as members of a lower social class when no one else in Japan would consider doing such a thing. Their so-called invisibility was partly psychological in cause—by dressing as a peasant, they were ignored and dismissed, or never even noticed at all, by the Samurai and other upper classes, a useful thing despite the oft fierce travel restrictions on the lower classes. More important, however, was their superior knowledge of survival skills, actual stealth, poisons, assassination techniques and unorthodox tactics. A common misdirection tactic, for example, would be to put one's clothing on a branch or a log while sneaking away (or planning a sneak attack). Ninja were also quite skilled with a variety of tools, such as the multipurpose kunai knife trowel. Plainly put, while a stereotypical ninja would jump around on rooftops in ridiculous clothing, a real ninja most likely would simply infiltrate the household staff and poison a meal. Among many other things, a good ninja always knew where his sanjaku tenugui was. Ninja also actively encouraged the spread of rumors of their magical abilities. It's a safe bet that, somewhere in Medieval Japan, some idiot must have attacked a decoy log and, upon discovering the log dressed in the ninja's clothing, came to the natural conclusion that the ninja had magically swapped places with the log. 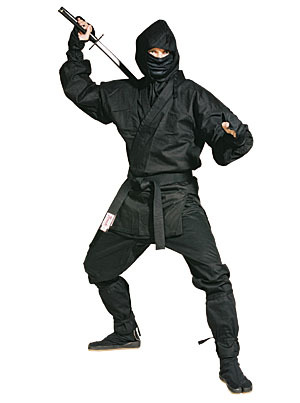 The "classic" ninja costume (see picture) is, in fact, the outfit worn by stagehands in traditional Japanese theatre. Japanese stagehands are frequently in full view on the stage, but the audience is trained to ignore them and thus they are considered "invisible" by the audience. It became the practice to hide ninja characters in full sight by putting them in the same outfits as the stagehands, for a startling effect when other characters were suddenly attacked by "thin air". Female ninja are often called kunoichi in a pun on the Japanese kanji for woman (女, onna/jo), which looks like it's made up of ku (く), no (ノ), and ichi (一). Kunoichi are often portrayed in media as experts in seduction, poisons, or poisonous seduction. Kunoichi are also often seen in outfits that combine a hodgepodge of traditional clothing, fishnet, bared skin, and strategically-placed weapons. In American movies, especially the ones from the '80s with "ninja" in the titles, only the hero ninja and the Big Bad ninja make any pretense of stealth or invisibility—and sometimes, not even them. Any underling ninja will be the class of Mooks known as Highly-Visible Ninja. One of the earliest Japanese cultural tropes to make it to the West, where it has now branched out into the McNinja franchise. Look for ninja to make use of the Smoke Out, the Flash Step and the aforementioned Ninja Log. In the late 20th Century, they became the arch-enemies of Pirates, for no reason other than the Rule of Cool. They were not, however, usually enemies of the samurai or shogun. Often they were hired by powerful figures to perform deeds that honorable samurai would not do. They were mainly used for espionage and sabotage, and sometimes assassination. Compare The Hashshashin, the Middle-Eastern counterpart. They did tend to come from lower classes (at least compared to samurai), but any media that says they were all peasants self-trained to attack the samurai as freedom fighters Did Not Do the Research. Due to the way the Japanese Language handles plurals, "ninja" is both the singular and plural form. Ginga: Nagareboshi Gin features the Iga and Kouga clans of ninja dogs. Recca and several others in Flame of Recca. The OVA version of Sakura Taisen slyly acknowledges the origin of the traditional ninja garb. The stage crew of the Imperial Theatre—the secret headquarters of the Flower Division—are all ninja, and ninja with all manner of "ninja magic" at that. The Canon Foreigner Sasuke Sarugakure in Ranma ½ subverts the character type by being borderline incompetent (he's clumsy and has virtually no combat capabilities, but is a master of stealth and can move too fast to be seen) in a neighborhood filled with world-class non-ninja martial artists. In the manga, Wholesome Crossdresser Konatsu plays it a little more straight. Ukyo Kuonji uses a spoof style that merges archetypical ninja moves with cooking tools. Similarly, the ninja in Ninin ga Shinobuden are incompetent ninja who usually don't even carry shuriken; when they all suddenly produce shuriken and every one hits its target, causing another character to think that maybe they are skilled after all, one calls his mother on a cell phone to tell her that he has touched a shuriken for the first time. Takamura Suoh from CLAMP School Detectives. Almost assuredly parodied in G Gundam. Midway through the story a German ninja is introduced and takes on the role of surrogate mentor to the protagonist, Domon. He even practices German Ninjutsu. Hilariously enough, he shuns the traditional garb of a ninja and dresses in clothes that are not remotely useful in maintaining stealth. Most absurd is the mask he wears. While it does obscure his features, it is painted in the bright, primary colors of the German flag and sports a jester hat-like protrusion. That doubles as a shuriken. Himawari! and its sequel series are all about the ninja. Most of the ninja in the series actually are fairly stealthy. The heroine herself...not so much. Volfogg from GaoGaiGar is a Transforming Mecha Ninja. Akira from My-HiME and Mai-Otome uses a lot of classic ninja tricks and tools, including shuriken, kunai and smoke bombs. She also uses the title "Secret Ninja", while fighting in disguise (which doesn't fool anybody). Curiously, sometimes she's seen interacting with other shadowy kuroko-wearers, implying that she indeed is a genuine ninja from a genuine ninja clan, even though that never becomes a major plot-point. Yoruichi and Soifon from Bleach, as well as the entire Stealth Force. Mahou Sensei Negima has Kaede. While she doesn't necessarily stick out like a sore thumb, she isn't very concerned with stealth either. Wields a big friggin' shuriken that from tip-to-tip is taller than she is. And that's saying something. Ryuusei no Rockman (AKA Mega Man Star Force) has an entire episode devoted to Ninja. Highly-Visible Ninja with all the typical tricks. Though, the guy teaching the main cast the tricks of the trade is damn good at it. They add -de osaru on the end of every one of their sentences...and apparently, the art of ninjitsu was developed by people from the ancient civilisation of Mu. One of the Ooparts is a Shuriken, and Mega Man can take on the form of a ninja... Of wood. Change 123, in its later volumes, introduces an all-female ninja clan whose members infiltrate into Motoko's school to recruit Motoko (or, rather, to recruit her alternate badass personalities). Unlike typical Highly Visible Ninjas, they actually blend into the normal world, wear plain clothes (even when they're in their ninja village), and use weapons which are disguised as normal everyday objects. Like their game counterparts, Koga and his daughter Janine in Pokémon Special are modeled after stereotypical ninja, but the author obviously had some fun making their techniques even more ninja-esque, such as outfitting their Pokeballs into shuriken. At one point, Janine even uses hand seals, presumably as signals to command her Grimer without having to actually say anything outloud. There's also a trainer class in some of the games, whose methods involve hiding and then springing out to battle whomever passes by. One two-part episode of Speed Racer featured ninja who drove ninja racecars. Since American audiences at the time had not yet heard of ninja, the dub for American TV called them "assassins." Black Star and Tsubaki. Black☆Star is your typical Highly Visible variety, and somehow manages to make a big deal of being 'stealthy' even when he bothers to try. Tsubaki is a member of a clan of ninja-associated Living Weapons (kunai, (big) shuriken, smoke-bomb, camouflage, katana, chain-scythe) and frequently has to remind her meister how he should be behaving. Such as the fact that telling your target you're here to assassinate them is a bad idea. Falcomon, who's a rather straight example of this trope, along with his evolutionary stages. His Champion form, Peckmon, is a Ninja Ostrich. Monitormon from Digimon Xros Wars, which beats out all other examples in ridiculous by being ninja with televisions for heads. In the Japanese version of Transformers: Robots in Disguise, the Spy Changers are portrayed as ninja. Gintama is another example of the Highly-Visible Ninja variety. It has Ayame Sarutobi using her ninja skills for stalking of all things. There's also Zenzo Hattori, The Oniwabanshuu and the Shinobi 5. Ninku: The heroes are all Ninja who face off against some former Ninja as well as practitioners of other ethereal martial arts such as Feng Shui users. The Ninku gain their powers by drawing on the power of the elements themselves which take the form of a dragon. This means they aren't constrained to chi or chakra or some finite internal reserves. Rurouni Kenshin has the Oniwabanshu, a clan of Kyoto-based onmitsu that are initially opponents to Kenshin under the leadership of Shinomori Aoshi. When Kenshin travels to Kyoto to fight Shishio Makoto, they become allies. It has been a common character type in American comics since the 1980s; for instance, the Marvel Universe villain clan, The Hand, cropped up then, and during that period, Frank Miller effectively changed Daredevil into one. Many, however, have noted that creators of Batman created him as a de facto ninja character without knowing it in the 1930s. Also from Larry Hama was Nth Man the Ultimate Ninja, featuring a white-haired modern-day ninja named John Doe, tasked with killing his childhood friend and Reality Warper in the midst of World War III. Michael Beck as "Ken Sakura", an orphaned American adopted into a ninja clan, in the 1983 TV movie The Last Ninja. Appear in The Last Samurai, with some of their methodology were accurately presented. Lady Ninja: Reflections in Darkness! The Shaw Brothers kung fu movie Heroes of the East features a ninja. Early in the film, the Japanese wife (Yuko Mizuno) of the kung fu hero (played by Gordon Liu) gives him a demonstration of ninjitsu. He is not impressed. Later, the hero fights the wife's old boyfriend, an actual ninja (Yasuaki Kurata) and out-tricks him at his own game. In both cases, the ninjitsu is based more on movies (Japanese ones rather than American ones): sneak attacks, hokey peasant disguises, gunpowder, etc., but does involve some real weapons. Even the costume is based on Japanese theater. The film subverts several ninja conventions: one, the ninja is portrayed as a man of skill and honor; two, the ninja is not out to kill anyone; three, his allegiance lies with his martial arts teacher, not a feudal lord. Batman Begins had a ninja school. Which was, apparently, located in Tibet. Big Money Hustlas: "Magic magic ninja, what?" The Japanese film Shinobi Heart Under Blade. Shogun features realistic ninja, and it's amazing to read James Clavell actually explaining to the reader what ninja are. Ninja in Cloud of Sparrows are rather more plausible than most other examples. They are very stealthy and good at dodging pursuit, but dress in normal clothes and are primarily employed as stealthy assassins and spies. Kudo, one of the two main ninja in the book, also indulges in a spot of Clark Kenting. He is also revealed to have poorer reflexes than gunslinger Matthew Stark. Eric Van Lustbader wrote a whole series of So Bad It's Good novels about ninja. Phoenix Force battled the Tigers of Justice, a radical Japanese group using ninja techniques to attack nuclear power plants to avenge Hiroshima and Nagasaki. In later books they receive the help of John Trent, a Japanese-American master of ninjitsu. Timothy Zahn's "Blackcollar" commandos are obvious ninja In Space. Their favored weapons are shuriken and nunchaku—low-tech to avoid enemy sensors. In the Discworld novel Thief of Time, the Monastary of Wen the Eternally Surprised has stereotyped ninja as Time Police. Lu-Tze is highly contemptious of running around rooftops in black outfits ("others trained them, I just tried to undo the damage"), and his own strategy of passing unnoticed as a humble sweeper is closer to the real ninja. Several Sentai series have them, such as the "Ninjetti" arc of Mighty Morphin Power Rangers and Power Rangers Ninja Storm. The original Japanese names of these sentai shows are Ninja Sentai Kakuranger and Ninpuu (Ninja Wind) Sentai Hurricanger, respectively. Shown as the film in two episodes of Mystery Science Theater 3000. Ninja using both 'traditional' weapons and explosives attack John Blackthorne and Mariko in the 1980 miniseries Shogun. Charlie from Spin City once daydreamed of winning the World Series, and fighting ninja. Insane Clown Posse often reference ninja in their songs, particularly in the song "Ninja". Juggalos also refer to themselves as "Ninja". In Lonelygirl15, Bree describes Tachyon as a ninja in "Training Hard". Ninja are also parodied in "My School Project" and the remix version, "Ninja Video by ElizKM86", during which Danielbeast makes a movie about ninja. Charlie depicts herself as a ninja in the animated segments of Kate Modern. Ask A Ninja is a website where viewers e-mail a guy questions and he answers them as a ninja would. The Onion did a piece about a ninja parade. No ninja were actually spotted, although they were kind enough to leave candy in children's pockets when they weren't looking. The Skaven of Clan Eshin in Warhammer Fantasy are essentially ratman-ninja. A certain fan-made army book for Nippon gives them squads of ninja as a Special choice whose main strength is mobility, and individual elite ninja as Hero choices that function like Dark Elf Assassins. Two more Ninja (as well as reprints of Ninja that originated in Kamigawa), Sakashima's Student and Silent-Blade Oni, appeared 7 years latter in the "Night of the Ninja" deck intended for the variant game Planechase. Feng Shui lists the Ninja as a PC archetype. Their Martial Arts skill and Fu attributes are just one point lower than the Martial Artist, and they have the second highest Intrusion skill in the game (the Thief has the highest with a 16 AV). In addition, one of the Fu paths of the game, the Path of the Shadow's Companion, is tailor-made for the Ninja, with powers that allow you to make silent martial arts attacks and bypass the Toughness of your opponent when attacking someone unawares. You also get to fight ninja a lot as both mooks and named characters. The Scorpion Clan, especially the Shosuro Assassins and Bayushi Ninja Infiltrators, in Legend of the Five Rings. Plays the trope straight and subverts it at the same time: the real assassins rely on disguise to blend in the crowd, while the "typical" ninja in black pajamas are Highly-Visible Ninja Mooks used often as a distraction. They ask that you call them "shinobi", though. The term "ninja" is somewhat offensive, as the other ninja in Rokugan are primarily shapeshifting servants of a Cosmic Horror that's also an identity-stealing version of The Virus. Yoshimitsu from both Tekken and Soul Series. Oboromaru in Live a Live. The King of Fighters' Mai Shiranui. Highly visible... yes, she is. Which means that Mai's native game series, Fatal Fury, goes here as well. In Garou: Mark of the Wolves, Hokutomaru takes her place as the game's ninja. And let's not forget Eiji Kisaragi, imported from Art of Fighting 2; and Jazu, a guest from Kizuna Encounter. Eiji's ninja nature is starting to be played for laughs, such as the inability to sneak up on a housewife (true, The Hero's mother... but still) and also refusing to chance his outfit when spying on his archenemies in a fancy restaurant. Spinoff Maximum Impact 2 introduced Nagase, another Highly-Visible Ninja described in-game as "The Ninja Computer Geek". Hanzo also appears as a Ninja in the Samurai Warriors games (though in real life, he was actually a Samurai). In the first game he was contrasted with Sanada Yukimura in a "ninja vs. samurai" way, but in the second game he's contrasted with Fuuma Kotarou, another ninja, in a similar way to their World Heroes counterparts. The other ninja is Kunoichi, an original character based on the Sanada Ten who supposedly did Yukimura's dirty work for him (subverting his own archetype). Then there are Sogetsu & Kazuki Kazama, and their magical. Altair from Assassin's Creed fits the MO of a historical ninja in that he is an assassin who escaped notice by blending in with a crowd, but lives in crusade-era Israel rather than feudal Japan. Ezio in Assassin's Creed 2 is more or less the same, only he can swim, is Italian and FABULOUS!! YMMV. Altair is based on the actual group where the word "Assassin" was derived from. There are even several events in the game based off of stories about that group. On the other hand, that group acted far more like the Ninja trope than historical ninja actually did. A certain not very good Neverwinter Nights module had the player as part of a sect of female ninja called Kunoichi (which happens to be a historically accurate term for female ninja). Strider Hiryu, from his eponymous game series. Crypto questions why there are Ninja in Japan in 1969 in Destroy All Humans! 2. Everyone he asks tells him to go with it, and that "everyone loves ninja". The titular character from Izuna Legend of the Unemployed Ninja and its sequel. Edge in Final Fantasy IV. Shadow from Final Fantasy VI. Yuffie in Final Fantasy VII, of course. And her gameplay clone in Ehrgeiz, Sasuke. The Commodore 64 game The Last Ninja and its sequel make this Older Than the NES. The Shinobi series features a ninja hero, who battles scores of enemy ninja in a variety of different situations, including while being on a ninja surfboard in the third game. In no particular order from Mortal Kombat: Sub-Zero, Scorpion, Reptile, Noob Saibot, Kitana, Mileena, Jade, Chameleon, Khameleon, Cyrax, Sektor, Smoke, Ermac, Rain and Frost. Fifteen ninja in the course of one very ninja-happy series. Technically, only Scorpion is a ninja. Sub-Zero, Noob Saibot, Cyrax, Sektor, Smoke, and Frost all belong to the Lin Kuei. Jade is Kitana's bodyguard, who is a princess, and Mileena is a clone, both of whom would likely be trained in some form of self defense. Rain, also royalty, is also likely trained in self defense and Reptile is another bodyguard. Ermac might count just from the sheer amount of souls he is made with, probability might dictate one of them was a ninja in life. Chameleon may too, I don't know his backstory well, but Khameleon is just a warrior as well. Most of them are made fairly moot anyways, as only Scorpion and the Lin Kuei are from Earthrealm anyways. The Tenchu: Stealth Assassins series, in contrast to many ninja series, places full emphasis on the ninja's true strength: stealth. Ninja in this series are unsuited for the open hand-to-hand combat of the Samurai, but are the undisputed masters of the stealth kill. Final Fantasies I, III, V, and Tactics. ShadowMan. Who scores double points for being a ninja robot. Don't forget what arguably may be his Expys, Phantom and ShadowMan.EXE. Triangle Heart 3 ～sweet songs forever～ has Shiro, Kyouya, and Miyuki Takamachi. They're usually bodyguards, but occasionally do some assassination work as well. The main character of Ninja Blade. The Dark Templar of StarCraft are Alien Ninja who can bend light to make themselves invisible. The Komoris in Red Steel are a clan of ninja who fight with guns and poisoned swords, and yes, they wear the stereotypical black pyjamas. Scott himself gets to undertake some ninja training over the course of the game. There are ninja in Mad Karate Man that serve as obstacles to prevent your revenge against businessmen from being fulfilled. You can just click them away though. The Wario Ware games have Kat & Ana, twin ninja preschoolers! A good number of ninja feature in the Suikoden gameverse, most of them being more visible than not. Kasumi from Mass Effect 2. Thane could also qualify. Mass Effect 3 brings us Cerberus Phantoms, which are ninja armed with insanely sharp wakizashis and are protected by barriers. There's also Kai Leng, who's basically the boss version of a phantom. The Soul Series gives us Taki. She's got the kunai/tanto/wakizashi, uber-agility and magical demon-sealing powers. Plus the purple skin-tight bodysuit. Also, the "create a character" in 3 had a class called "ninja" that could learn how to wield kuni (with use of ninjustu) , a katan and over sized shuriken (blatant use of jumping and the overly large throwing tool), a sickle that seemed to have been the love child of Ivy's whip blade and a chain whip with some sickle thrown in as an afterthought, Taki's moveset, and (the closest to actual ninjaness) Setska's parasol with a blade hidden in the handle of it. Any character creation after forwent any movesets only available to custom characters, so they then had to use character weapons. Gale from Virtua Cop 3. In the Street Fighter series, Guy uses traditional ninjustsu with street fighting influences, Geki and Ibuki fits the popular image of a ninja, and Vega mixes savate and ninjutsu. Shinobi from Red Alert 3, who can throw Shurikens, smoke bombs and kill with a single sword blow. He's a ninja in Archie's Sonic the Hedgehog, but not in Sonic the Comic, due to the fact it ended before he was made into a ninja. The Scyther, Nincada, and Shelmet lines from Pokémon all have ninja motifs. Curiously enough, they are all also Bug-type Pokemon (Scyther=praying mantis, Nincada=cicada, Shelmet=snail) as well. Koga, the Poison-type Gym Leader from Pokémon Red and Blue, has a ninja motif as well. He's training his daughter Janine in the art, and when he makes it to the Elite Four of the Indigo League in Pokémon Gold and Silver, she takes over the Gym. Though they're technically not ninja per se, the armor for the Dark Brotherhood in The Elder Scrolls V: Skyrim certainly looks the part. The Brotherhood's signature skills also mesh fairly well with the assassin part of the trope. Aztec Wars has Ninja, clad in blue, as one of the Chinese units (supposedly, the Chinese empire in the game has conquered most of Asia). They're the basic infantry unit, and they fight with martial arts. Ninja appear a few times in Order of the Stick including a half-orc ninja who falls for Elan. A Running Gag is for ninjas to go undetected by other characters even when they're not actually hiding. Toshubi is a ninja mouse. Real Ultimate Power: The Official Ninja Webpage! Ultimate Ninja, leader of the Legion of Net.Heroes. Can't forget the Ninja-Style Dancer. In V3E1 of RWBY, Nora describes Ren as a ninja, even though he is (pseudo-)Chinese and not (pseudo-)Japanese. Teenage Mutant Ninja Turtles, naturally. Basically every and any action/adventure cartoon in the U.S. is bound to feature Ninja at some point. Skunk Fu!, ostensibly a children's show, has Ninja Monkies! Animated went on to reveal that there's an entire order of ninja back on Cybertron, which includes Animated versions of almost every Autobot martial artist, melee-weapon user, fist fighter... and Grandus. In an episode of Thundercats, Mumm-Ra summons a samurai named Hachiman and tries to trick him into fighting Lion-O. When that doesn't pan out and one of his minions is captured, he tries to salvage the situation by doing the unexpected: Summon a ninja. Kabuto, the main villain of Tokyo Mater has ninja racing cars for henchmen. He summons them to distract Mater about halfway through the short, only for them all to be knocked out by Dragon McQueen. At the end of the short, Mater wins the race, and since Kabuto threatened him that if he lost the race, he will strip Mater of his modifications, when Kabuto lost, he is stripped of his own modifications, and is laughed at by his own ninja who then turn to the side of Mater, now "King of all drift racers." Starscream: "Do you not see that you are vastly outnumbered?" Wheeljack: "I see fellas who might vastly enjoy watching me pound some dents into you." American Dad: When Roger shows up in one episode: "I'm a ninja everybody! I'm doing NINJA stuff now!!" Ninja can catch arrows in flight - BUSTED! Guiness book or Records champion Ninja, they shot safety arrows at him. 6 arrows hit him. He jumped away from 3 and caught the 10th arrow; in a real fight, he would have been dead before that 10th arrow. They proved that ninjutsu really does have a deadly punch (compressing the ribcage enough to cause fatal damage to the heart). Hattori Hanzo, Iga ninja in service of the Tokugawa, and probably the ninja equivalent to Miyamoto Musashi. Actually, Hanzou is more of a proto-Ninja; as at that time, he was seen more as a retainer with an exceptional special skillset and known for tactical bravado (earning him the moniker 'Devil Hanzou')- however he was also reknown for swordsmanship excellence, and skills with a spear (he is NOT however, the same person as another historical Hanzou, Yari-Hanzou, who as the name implies, was a master of yari/spear combat). His appearance as a ninja nowadays is probably a direct result of his tactical choices that earned him his Devil nickname; tactics along the lines of subversion, misinformation, assassination, etc. Don't mistake him for wearing all-black or anything like that, pictures and portraits exist, and he looks quite like a normal samurai of the times. Legend or not, all aspects considered, he's quite the interesting figure what with being both ninja-and-samurai all in one. Sarutobi Sasuke, one of the men counted as Sanada Ten Braves. Bodyguard of Sanada Yukimura. He inspired not one, but FOUR Ninja in Naruto: Hiruzen Sarutobi the Third Hokage; Konohamaru Sarutobi, who is basically Naruto's apprentice; Asuma Sarutobi who is Shikamaru's sensei; and finally Sasuke Uchiha himself. Technically five, as we have recently been told that the Third Hokage's father was actually named Sarutobi Sasuke. Fuuma Kotarou, Hojo's ninja, most famous for that myth about him luring and killing Hanzou in a naval battle, suicidally. The SAS, Navy SEALs, Spetznaz etc. are ninjs in all but name. Or rather, Ninja are part of SPECWARCOM in all but name (and time period). Masaaki Hatsumi, who claims to be part of the last remaining ninpo lineage. And yes, they wear the black pajamas. They also wear pajamas in various colors that fit the environment. There's also the Bujinkan system which teaches unarmed and armed combat techniques from Ninjutsu while omitting the stealth and infiltration training. One of the more prominent teachers of the school, Stephen K. Hayes, since removed from the rolls, is famous for having released a number of "how to" books on Ninjutsu. Ashida Kim is a self-proclaimed ninja who is based in Lake Alfred, Florida. Having written over 30 books on the subject, he claims to have learned his ninjitsu from someone named Shendai. He also claims to have met Count Dante (who is best known for his "Deadliest Man Alive" ads appearing for years in comic books) and trained under him. He also has posted a $10,000 challenge to anyone who wants to fight him. It should be pointed out that the aforementioned $10,000 is not awarded to the person who defeats Kim. It is Kim's fee (plus travelling/lodging expenses and a $25,000 appearance bond assuring the challenger is "serious") for showing up to the fight. Long suspected to be the pseudonym of a Christopher Hunter, recent investigations have confirmed that Ashida Kim's birth name is Radford Davis. This page was last edited on 18 September 2018, at 23:42.